In winter, many fruit trees need pruning to encourage better production. But the awkward feel and heavy weight of so many pole pruners can leave us dreading this yearly task. That’s why I love the Fiskars 62 inch Pruning Stik. This pole pruner uses good design elements to do one thing perfectly: trim small branches with ease. It weighs in at less than 2 pounds, which means even people who aren’t weightlifters can prune for hours without tiring. And the streamlined design makes it a pleasure to use. Why I love it: It smoothly cuts branches up to 1.25 inches in diameter, and since the slicing blade has a non-stick coating, the blades don’t get gummed up with sap. The rope that pulls the cutting blade is completely encased in the pole, so you’ll never get the rope tangled in a branch you can’t reach (phew!). Even if you’re standing in an awkward position under the tree, you can still get a perfectly-angled cut because the pruning head swivels 240 degrees. 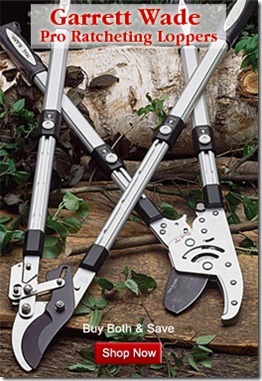 There are two handles to pull to make pruning cuts. The ergonomic, non-slip grip in the center of the pole is the one you’ll use most often, while the ball-shaped handle at the bottom of the pruner allows you to reach juuuust a couple feet taller. 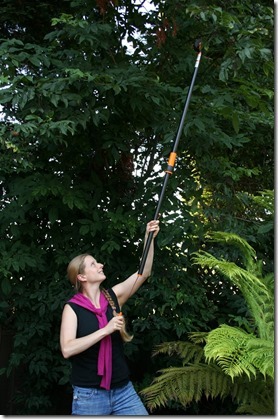 The Pruning Stik is particularly helpful for sloped or uneven ground, where using a ladder can be unsafe. You can even use it as a no-bend gardening tool, to thin red-twig dogwoods and other plants with stems low to the ground. 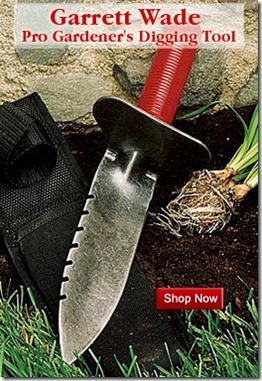 What it doesn’t do: Since the beauty of this tool is in its lightweight simplicity, there are no added features like an extendable pole or an attached pruning saw. But in my view, this is actually a good thing, because those features add weight that makes it harder to get a clean, controlled pruning cut. The verdict: This is my go-to tool for winter pruning of apples and other fruit trees, as well as seasonal touch-up of shrubs and vines. Mine has lasted through years of daily professional use, and the only thing wearing out is the paint. We agree with you that the Pruning Stik (for some reason called the UP82 Pruning Wand in Australia) is an excellent tool – they are proving to have excellent longevity too. Importantly, plenty of spares are available should you prune so often that you wear the blade or tape and cord out. As you mentioned, they are incredibly light weight. I think people are really surprised something so long can be so lightweight. Fiskars pruning stik is one of the best tools for cuts branches.But I need to know, Is it possible to change the Fiskars pruning stik blade?